This week, swears, Jonathan Meades, salad bowls, Garry Bushell, crash diets, celebrity quotes, Jeff Goldblum, Megan Fox, Nick Knowles, Dirty Dancing and Hollow Man. This week we've got toucans who can, Eton Mess that isn't, Madonna and Jesus who didn't, Lembit Opik who shouldn't, 24, Peter Hitchens, the Moon, Apollo 11 and Dominic West. 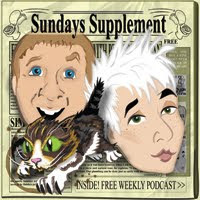 This week we've got the Beckhams, Fab Over 50, Yoda, Stephen Fry, Letters, Top Trumps, Horoscopes and a dog called Bowser. A Saturday special this week, featuring the science of crowds, weather forecasting, the Chuckle Brothers, flip flops, Ronaldo, hate mail, The Great Gatsby, Henry VIII and Scrabble.